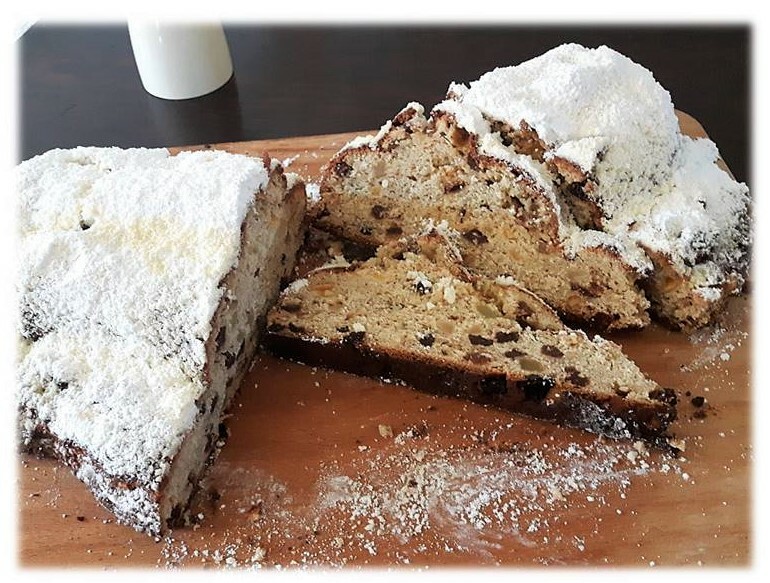 To spread some Christmas vibes on my blog, I thought I share with you a traditional German Christmas baking recipe- the Christmas Stollen. The Christmas Stollen is a seasonal alternative to a classic cake or cookies. Here is how you do it. Note: The special baking tin is not a must-have, you can also mould the dough to achieve the "Christmas Stollen shape". 1. Pour the flour into a large mixing bowl. 2. Make a little hollow in the middle and add yeast, milk, sugar, vanilla sugar, salt, low-fat curd, eggs, soft/liquid butter, spices, and knead to make a firm dough. 3. Cover and let the dough rest for 30 minutes. 4. Now knead in the candied lemon peel, candied orange peel, sultanas, currants, and almonds. 5. If you use the baking tin, pour the cake into it. Otherwise, shape the dough into a loaf. Take the rolling pin to press a hollow into one side of the dough, fold the bigger section over the smaller. Leave ca. 5 cm of the tinier dough part uncovered. 6. Brush the dough with melted butter and bake for about 60-70 minutes at 200°C. 7. Immediately after baking, remove the Stollen from the form, spread with melted butter again, and then sprinkle thickly with icing sugar. For serving, cut the Christmas Stollen into slices. Bon appétit and don't forget to comment how it turned out. Until then, have a good one. Super Rezept, habe ich schon ausprobiert. Schmeckt super gut.